This is a grow your own hops (beer) plant kit which comes with everything you need. An ideal little extra gift for any occasion, this Grow Your Own Beer Kit is the perfect present for any beer lover. Hops are the female flower cluster of the plant, which belong to the hemp plant family that grow wild though out the northern hemisphere. They are a fast growing plant that has heart shaped leaves. Hops have many uses in brewing and medicine. Today’s Hops are agricultural crops which are an essential ingredient for making beer. 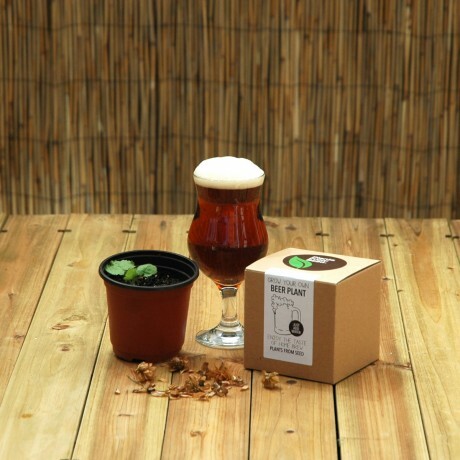 Inside the Grow Your Own Beer Plant Kit is two terracotta coloured small plant pots, one professional grow pellet and your coffee plant seeds.An instruction sheet is also included on how to grow and take care of your new arrival.